Today more than ten versions of the composition are known in horizontal format, differing widely in quality and condition. 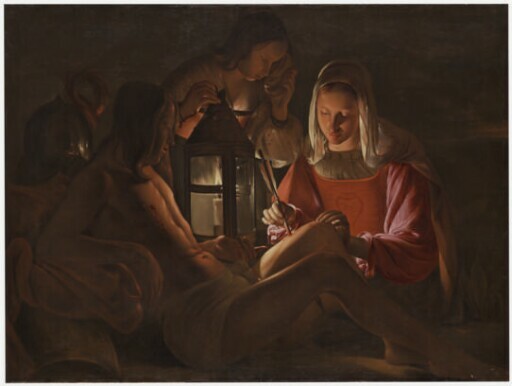 Opinion on the Kimbell painting is divided: most scholars consider it to be a copy; others believe that it may be one of the works painted by La Tour himself, possibly the version he gave to Charles IV. The painting has suffered damage (especially in the darkest passages) from the transfer of the paint layer to a new canvas, rendering connoisseurship difficult. Nevertheless, it exhibits evidence of reworking or pentimenti during its creation, as well as the use of preliminary markings and incisions to establish the contours, a distinctive feature of La Tour’s working method. Most important, the palette, modeling, and brushwork in the better-preserved passages are of a quality approaching La Tour’s autograph works. Reportedly from a convent, region of Marseille, France, before 1918.
purchased through (Wheelock, Whitney & Co., New York) by Kimbell Art Foundation, Fort Worth, 1993.